Patience, Grasshopper. While a man cannot change the river, the river may change a man. The river is the flow of time and documents (which you should read for yourself) and the rocks in the rapids hindering its flow are called lawyers. Enough esoteric wisdom for the day! Let's go drive our trucks! 2015 ED Tradesman 4x4, 3.92 limited slip diff, trailer brake module, trailer tow mirrors, running boards, roll up tonneau cover, Air Lift 1000 rear coil spring air bags, spray in bed liner. Original owner 32,000+ miles. 20 foot Dune Sport custom toy hauler @ about 4,560 lbs empty, with WD hitch and sway bar. 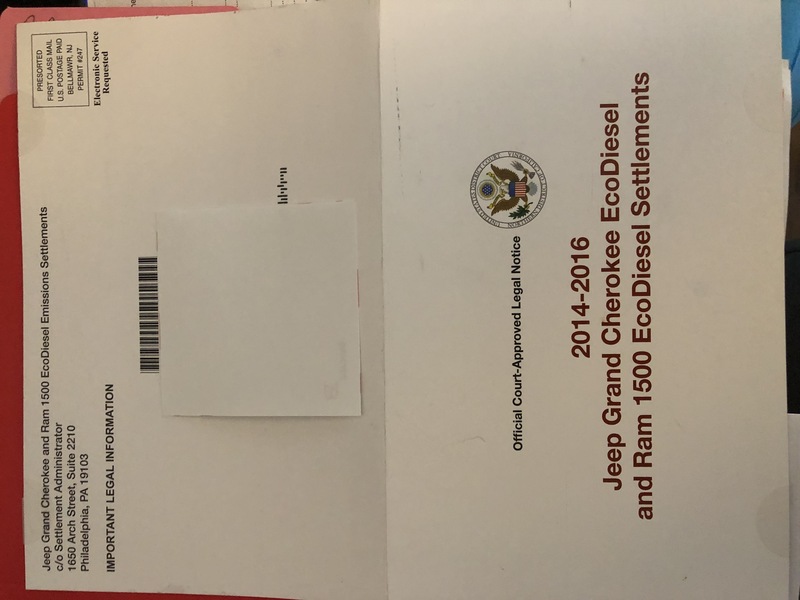 Their website (www.ecodieselsettlement.com) is linked on the Ram Trucks and Jeep official corporate websites, so if they are independent ambulance chasers (like some other law firms I won't name), they must be pretty good to have gotten FCA to add links for them on the Ram and Jeep corporate websites. We'll all know more once the settlement is finalized in May. They are NOT ambulance chasers. It's the official website and mailer for the settlement. Let's not confuse lawyers with the court-mandated website and mailer. I've received several letters from ambulance chasers advising that I not settle for the paltry $3075 offered through the settlement, and also the official information sent by the Settlement Administrator. I did register on the previously mentioned ecodieselsettlement.com website. Are you JOKING???? They are ABSOLUTELY “ambulance chasers”!!! They are going to take just under $60 MILLION dollars themselves, which will be MORE than all the rest of the settlement (to me and you) combined! These class-action lawsuits are the biggest ripoff to us customers ever invented. The attorneys should be getting about 1 million for their troubles and work, and each of us should get more like $6,000 per vehicle. But unfortunately we will NOT get a voice, which is the SADDEST part of the untie thing. The total settlement cost to FCA is around $800mil. I'm not a mathematician by any means, but i think that number has an extra 0 over the $60mil legal fees, so i think thats a bigger number. 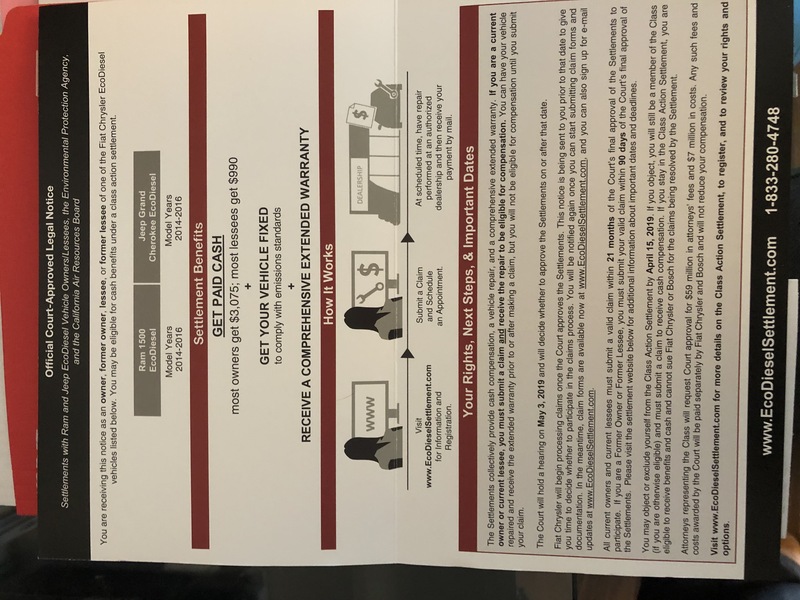 Absolutely nobody is forcing you into this settlement, if you think you are due $6k, you are free to opt out of the class and pursue your own claims. You dont even need to hire an "ambulance chaser" since you have so much disdain for them, you can pursue it all on your own. So your “ok” with them STEALING 60 million dollars for a few weeks of work? Yes, i'm ok with that. I'm also ok with whatever amount you STEAL in wages for a few weeks of your work. The lawyers took on all the financial risk in pursuing this case for over 2 years now, without a single penny of liability to you or other class members. If the court determines that this amount is fair and reasonable compensation for the legal work performed, then maybe the court know what they are doing? Ok, you obviously work for them and are one of “them”. “maybe the court knows what they are doing?” LOLOLOLOLL!!!!!! Yea, that’s it, the court knows what they are doing! LOL. Thanks for that, that is one of the funniest things I’ve read or herd in YEARS!! An absolute crack up. Seriously, thanks for the laugh. Now, the part I don’t like, you say “without a single penny of liability to [me]”, REALLY?? If I opt in or do nothing which automatically opts me in, I get $3k. If my truck blows up tomorrow, I get NOTHING for it. So I would end up out of about $60 GRAND less a few grand I get for the fire sale. On the other hand, if I opt out now, then my truck blows up. I then take FCA to court to get warranty money/truck fixed because they were neglegent..., the court says “Sorry, you had your chance the case was already litigated, and I get nothing. This occurs all the time. The courts do not have time to review the details for every little johnny that had issues that may or may not have been caused by faulty manufacturing.... so I am screwed, any way you look at it. As far as stolen wages, I get paid for the work I do. I don’t get paid MILLIONS of dollars to RIP people off. FIFTY MILLIUON DOLLARS!!!!! Over 2 years of work? They worked on this case for a total of about 20 days over that “2 year period”. And most of those 20 days were spent at lunch eating $200 aged steaks while “discussing” how much to rip the people off. 2 young ladies (called “admistrators”) are paid $60k per year to send the letters out and receive correspondence and scan them into the system. So there total expenses for the case are a couple hundred thousand dollars. Let’s be nice and pay the 2 attorneys $500k each for the year working on the case. They are at $1.2 million in expenses, and are living the dream with Yachts, big houses in the Hamptons, golf, $200 steak lunches..... WHAT HAPPENED TO THE OTHER $49 MILLION?????????????? Instead of us (remember us? the truck owners who spent their hard earned money to buy a truck) getting that $49 million, the AMBULENCE CHASERS get it. That my friend, is the definition, of an AMBULENCE CHASER. And WE, are getting RIPPED OFF! And the courts know damn well we are, and don’t give a damn. The contingency fee system giveth and the contingency fee system taketh away. Without a contingency fee system injured parties would have to pay lawyers up front (or at least sign a payment contract). The entire risk would be on the plaintiff. If the party causing the injury is wealthy (or a business and thus likely better funded than the plaintiff) all the defendant(s) need to do is delay and wait you out. (This is a common tactic by insurance companies). When lawyers take on cases on a contingency fee basis they assume most of the risk. You, in essence, are paying someone to assume part of your risk in filing a lawsuit. And there are real costs in a significant lawsuit (which, by definition, class action lawsuits are.) Thousands of person-hours, filing fees, paying for "consultants" to counter the company's "expert witnesses", and much of this is done before knowing if the court will allow the litigation to proceed as a class action filing. True "ambulance chasers" (the ones advertising during the evening news... "Hurt in a car wreck? Call me. It's just that easy.") don't put a lot of skin in the game but big time tort firms do. Reasonable people can disagree about the merits of a particular lawsuit and the appropriateness of the compensation to the lawyers. And anyone is free to pursue their own legal action but must remember that, absent very deep pockets and/or a law degree, they will most likely wind up hiring their own attorney.... on a contingency fee basis. ncskibum and EZmac91 like this. "We have not inherited the Earth from our parents, we have borrowed it from our children."